Jenny Haskins Touch of Magic Tour! Sign Up Now for this AMAZING TWO DAY EVENT to learn the tricks and tips used by the Magician Herself, Jenny Haskins. YOU will learn incredible techniques for six amazing projects in a festive & FUN workshop environment, all at the instruction of a Jenny Haskins Educator! You won’t just learn it in theory, you’ll also EXPERIENCE it WITH YOUR OWN HANDS at this incredible event! EVERY attendee will take part in stitching out one or more of the amazing Touch of Magic Projects! No need to bring anything but your own imagination and passion for embroidery and sewing! A brand new, top of the line embroidery machine will be provided on site to make you feel like a master of embellishment already! All stabilizers, thread, designs, and materials needed to stitch each project will be supplied, EVEN lunch and refreshments! 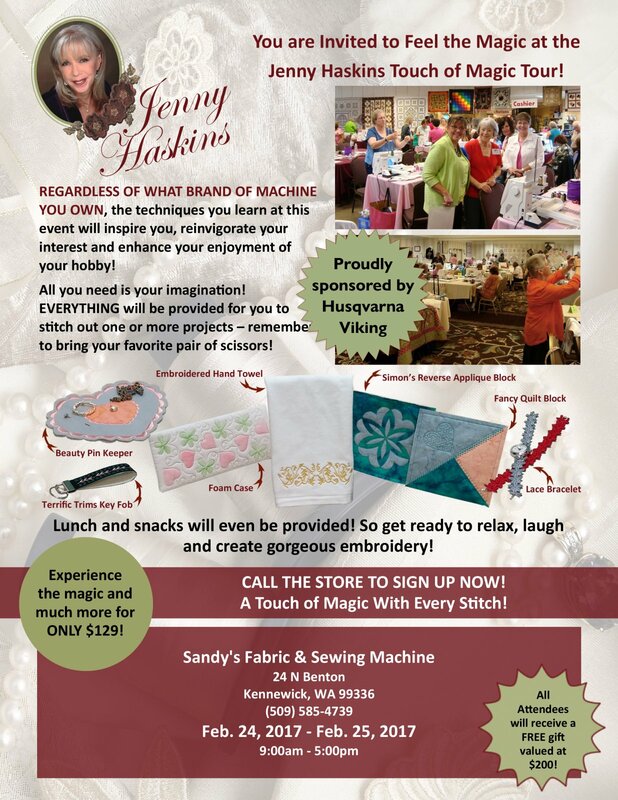 Make the Jenny Haskins Magic your OWN with innovative techniques, inspiring designs and stress free embroidery!